This is a set of extensions for using the simple but powerful Ecwid E-Commerce platform. 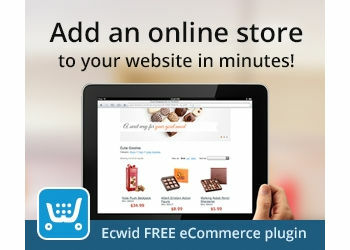 Ecwid is an awesome e-commerce software platform that allows you to add shopping cart functionality to any current site and also get a mobile and Facebook store in one package. Product Browser - This is the main container and it is mandatory; this will contain your products, categories, search results, the checkout options etc. Minicart; This widget contains the Shopping Bag; when viewing products, you can Drag & Drop them to the shopping your basket. Language; Optionally change the language of your store.